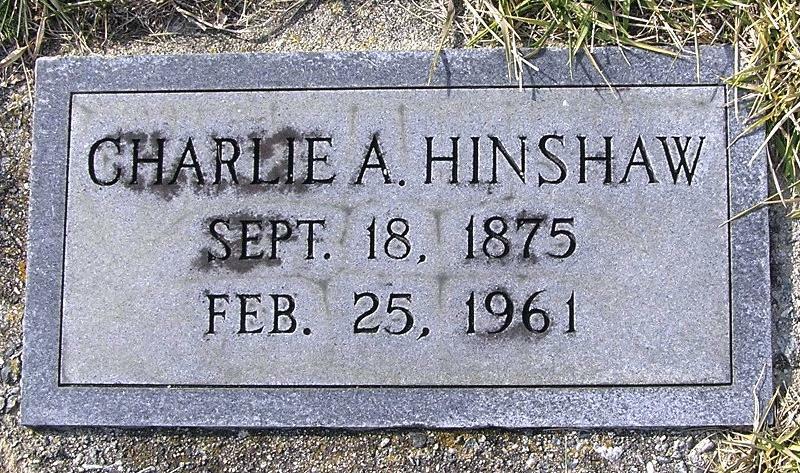 Hinshaw, Charlie, head-of-household, age 24, born Sept 1875 in North Carolina; parents born in North Carolina; married 2 years; occupation: blacksmith; owned farm (mortgaged). Hinshaw, Sallie, wife, age 19, born Dec 1880 in North Carolina; parents born in North Carolina; married 2 years; 1 child, 1 living. Hinshaw, Virnie, daughter [sic], female [sic], age 4 months, born Jan 1900 in North Carolina; parents born in North Carolina. Hinshaw, Charlie A., head-of-household, age 34, born in North Carolina; parents born in North Carolina; first marriage, married 12 years; occupation: farmer, general farm; owned farm (mortgaged). Hinshaw, Sallie E., wife, age 29, born in North Carolina; parents born in North Carolina; first marriage, married 12 years; 5 children, 5 living; occupation: farm laborer, home farm. Hinshaw, Delma, son, age 10, born in North Carolina; parents born in North Carolina; occupation: farm laborer, home farm; attended school. Hinshaw, Fannie, daughter, age 8, born in North Carolina; parents born in North Carolina; occupation: farm laborer, home farm; attended school. Hinshaw, Nellie, daughter, age 5, born in North Carolina; parents born in North Carolina. Hinshaw, Jabin J., son, age 3, born in North Carolina; parents born in North Carolina. Hinshaw, Virginia C., daughter, age 10 months, born in North Carolina; parents born in North Carolina. Hinshaw, Chas A., head-of-household, age 44, born in North Carolina; parents born in North Carolina; owned home; occupation: farmer and [..unclear..] milling owner. Hinshaw, Sallie, wife, age 37, born in North Carolina; parents born in North Carolina. Hinshaw, Nellie, daughter, age 15, born in North Carolina; parents born in North Carolina; attended school. Hinshaw, Jaben, son, age 13, born in North Carolina; parents born in North Carolina; attended school. Hinshaw, Virgie, daughter, age 11, born in North Carolina; parents born in North Carolina; attended school. Hinshaw, Gracie, daughter, age 9, born in North Carolina; parents born in North Carolina; attended school. Hinshaw, Charliene, daughter, age 7, born in North Carolina; parents born in North Carolina; attended school. Hinshaw, Raymon, son, age 2 years 1 month, born in North Carolina; parents born in North Carolina. Hinshaw, Delmer [unclear], son, age 20, born in North Carolina; parents born in North Carolina; occupation: truck driver at saw mill. Hinshaw, Nettie [unclear], wife, age 20, born in North Carolina; parents born in North Carolina. Hinshaw, Charlie, head-of-household, age 54, born in North Carolina; parents born in North Carolina; first married at age 22; owned home; no radio in home; occupation: farmer, general farm; not a veteran. Hinshaw, Sallie, wife, age 49, born in North Carolina; parents born in North Carolina; first married at age 17. Hinshaw, Charlie Hazeline, daughter, age 16, born in North Carolina; parents born in North Carolina; attended school. Hinshaw, Raymond Earle, son, age 12, born in North Carolina; parents born in North Carolina; attended school. Hinshaw, Charlie, head-of-household, age 64, born in North Carolina; completed 6th grade; on Apr 1 1935 was living in the same house; owned farm ($6000 value); occupation: farmer, farm. 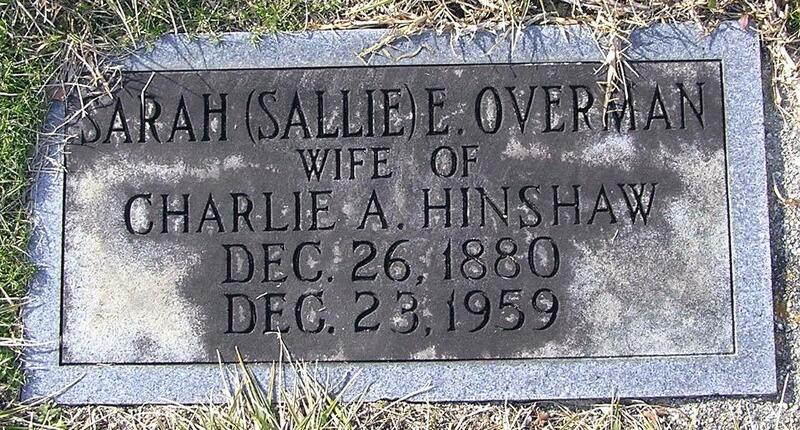 Hinshaw, Sallie E, wife, age 59, born in North Carolina; completed 6th grade; on Apr 1 1935 was living in the same house. Hinshaw, Raymond, son, age 22, born in North Carolina; completed 1 year of high school; on Apr 1 1935 was living in the same house; occupation: farmer, farm. Hawks, Creede, laborer, age 21, born in Virginia; completed 7th grade; on Apr 1 1935 was living in the same place/county; occupation: farmer, farm. 1900 census, Patterson Township, Alamance County, North Carolina; roll T623-1180, ED 1, page 9B, line #58, dwelling #182, family #182. Contribution from Kenneth Nolon Hinshaw. 1920 census, Patterson Township, Alamance County, North Carolina; roll T625-1282, ED 2, page 5A, line #19, dwelling #93, family #93. 1930 census, Patterson Township, Alamance County, North Carolina; roll T626-1671, ED 1, page 9A, line #24, dwelling #176, family #177. 1930 census, Patterson Township, Alamance County, North Carolina; roll T626-1671, ED 1, page 9A, line #27, dwelling #177, family #178. 1940 census, Patterson Township, Alamance County, North Carolina; roll T627-2868, ED 1-1, page 8A, line #9, household #132.